Education and social mobility can alleviate child poverty, but not in the way the government supposes, i.e. by improving future educational outcomes of poor children in order that they do not become poor adults. Rather, child poverty in the here and now can be alleviated if we allow low-income parents free access to further and higher education. The UK Child Poverty Strategy 2014-2017, released for consultation by the Coalition Government last February, is focused on ‘breaking the cycle of disadvantage’ and on ensuring that ‘where you start in life should not determine where you end up’. Two of its three routes to achieving this are: Supporting families into work and increasing their earnings and Preventing poor children becoming poor adults through raising their educational attainment (The UK Child Poverty Strategy 2014-2017,p.11). To address the first route their principal means of supporting families into work and increasing their earnings is through the Work Programme and other employment-related activities such as raising the minimum wage and the personal tax allowance. A secondary means is through ‘improving qualifications’. Further investigation reveals that this translates into improving basic literacy and numeracy. To address the second route, their principle means of preventing poor children becoming poor adults through raising their educational attainment, is to focus on compulsory schooling with the responsibility and accountability for this lying with schools, teachers and parents. As the government notes, they want to ‘ensure that the parents of tomorrow will have better qualifications (ibid, p.25)’ -presumably better than the parents of today. Now, this raises many areas of concern, from the lack of consideration for the lives of children as lived in childhood (Ridge, 2002) to the ability of employment to lift families out of poverty (Shildrick et al, 2012), given the fact that there are more poor children in households with a wage-earner than without; however, I would like to focus on an issue that I have come across with my current research with the Child Poverty Action Group, and that is the further and higher education of parents living in poverty as a route into work and, hopefully, out of poverty. In my longitudinal, qualitative study of twenty families living in poverty, ten in England and ten in Scotland, four of my Scottish ten were able to access further or higher education during the course of the research. None in England were. Two of this four completed further education and obtained their first job since becoming a parent: one is the mother of three boys aged 6, 10 and 13 and the other the mother of two boys aged 10 and 12. The remaining two went on to study degree programmes: these two mothers have one son each. The antecedent to accessing education for these women was gaining confidence and skills through volunteering. These women gained in wellbeing, confidence, skills and self-esteem. They made friends and widened their social networks. The lives of their children demonstrably improved. Of her new job, Jennifer says: ‘I totally love it. I’m really, really happy. So, last year was a great year for me. I passed my driving test, got my wee car, which I saved up and paid for myself, and I took my kids on holiday. I love it, totally love it’. Jennifer says that the knowledge that she has completed a college course and succeeded in getting a job she loves has had a positive impact on her children, particularly her eldest son (aged 13), who has told her that he is proud of her. She says: ‘my oldest one, he’s often saying to me: “It’s good the way you are now, you’re really happy now. Remember when it was like this?” So he feels a positive change. So that’s really good’. This is only a brief glimpse into this research but I want to highlight that in Scotland, education is a viable route into employment and out of poverty for parents who are unemployed, due to the system of no fees in Scotland (this is not entirely straightforward as becoming a student when you’re a parent can raise issues with the benefits system, and I will write about those another time). In England, there has been a 40% decline in applications to universities from part-time students, amounting to 105,000 fewer applicants, 9/10 of whom are mature. For full-time students, there has been a 14% reduction from 2010 to 2013, amounting to 18,500 fewer applicants. Among this potential mature student community will be parents and lone parents. By increasing the fees in other parts of the UK to £9,000 per year, the government has effectively removed access to further and higher education for many poorer parents and prevented a route out of poverty for them and their children. Ridge, Tess (2002) Childhood poverty and social exclusion: from a child’s perspective, Bristol: Policy Press. Shildrick, Tracy, MacDonald, Robert, Webster, Colin and Garthwaite, Kayleigh (2012) Poverty and Insecurity: Life in Low-Pay, No-Pay Britain, Bristol: Policy Press. Let me put my cards on the table. I am a researcher. I work in a university. As a social scientist, I get paid to better understand the world in which we live and I choose to focus on poverty. Therefore, I have a vested interest when I say that research on poverty is important and that academics can be useful allies in the fight against poverty. I understand the arguments that we already know much about poverty and that our priority should be tackling it. I also understand the view that research about poverty should be led by people experiencing poverty, as they are best placed to understand what it is like to live with it. But I would argue that numbers also matter, numbers shed light on aspects of poverty that we tend to ignore, and that part of what we do to tackle poverty in Scotland must be shaped by evidence. Here, I draw from recent evidence on poverty in Scotland to identify three issues that should shape our anti-poverty activity in the years’ ahead. 1. The number one cause of child poverty in Scotland is parents’ dependency on drugs, alcohol or other substances. At least, that’s what people in Scotland think. One in three Scots think that this is the main reason for child poverty (34% in 2012), with four in every five Scots thinking that this is a contributory factor (82% in 2012). Scots are also much more likely than people living in Wales and every English region to think this way (while 34% of Scots agree, belief that this is the main reason for child poverty in the UK ranged from 15% in South East England to 27% in North East England in 2012). This question has been asked in the British Social Attitudes Survey in 2009, 2011 and 2012 and on each occasion Scots were found to be more likely to think that this the main cause of child poverty. Few would argue that a parent’s dependency on drugs, alcohol or other substances is not related to child poverty. Readers of the Scottish Anti Poverty Review might question whether this was cause or effect of poverty (effect = people in poverty seeking escape through substance abuse, as opposed to cause = child poverty resulting from substance abuse in the first instance). However, I would be surprised if the higher numbers of Scots who explain child poverty in this way is not indicative of ‘victim-blaming’. To the best of my knowledge, there is no evidence to suggest that addiction and substance abuse is actually much more likely to contribute to child poverty in Scotland, than elsewhere in the UK. Why then do more Scots perceive that to be the case? It must be a concern for those seeking to tackle poverty in Scotland that Scots are so much more likely to make sense of child poverty in terms of ‘parental dependency on drugs, alcohol and other substances’ (34% main reason), compared to, for example, ‘social benefits for families with children are not high enough (7% main reason), ‘parents work does not pay enough’ (5% main reason) and ‘because of inequalities in society’ (6% main reason). The evidence suggests that we need to do more to challenge the ‘victim-blaming’ that is likely to be associated with this way of thinking and to better educate Scots as to how poverty develops and is sustained. This is particularly important at a time when welfare services and social security budgets are being threatened. We need solutions for poverty in Scotland that are based on a proper and evidenced – rather than a populist and anecdotal – understanding of the problem. The anti-poverty sector cannot afford to ignore the extent to which these attitudes prevail in Scotland. 2. The majority of both children and working-aged adults who live in poverty are living in households in which at least one adult is in paid employment. Work is not a route out of poverty for all. For some years’ now, there has been growing concern about the number of people in work who are living with poverty. Intuitively, in-work poverty just doesn’t make sense. Work is understood as a common-sense solution to poverty. On the other hand, there is a deeply held belief that not wanting to work is cause of poverty (interestingly, 15% of Scots think that this is the main reason for child poverty in 2012, the second most common explanation behind parental substance misuse, with 59% of Scots thinking that this is a contributory factor). The Scottish Government estimates that 110,000 children in Scotland (59% of those living in poverty) and 250,000 working-aged adults in Scotland (52% of those living in poverty) were in poverty while living in a household with at least one adult in employment in 2012/13. We have a problem in Scotland that work is not providing a route out of poverty at the current time. It may be a bigger problem than that: we may be at the start of a trend when a growing number of people experiencing poverty are living in households with work. In my mind, there is not much wrong with encouraging and facilitating the labour market participation of people who are not working. However, the evidence suggests that this is not going to eradicate poverty in Scotland. If we are serious about tackling poverty in Scotland and we are committed to using welfare-to-work as a strategy to achieve this, then much more attention needs to be given to working conditions and remuneration than at present. Almost all Scots think that tackling child poverty is important and that there is a lot of child poverty in Scotland. On a brighter note, survey research with a representative sample of over 1,200 adults in Scotland (McKendrick, 2014) recently found that 98% of Scots think that it is important to tackle child poverty in Scotland, with 82% of Scots considering tackling child poverty to be “very important”, and a further 16% considering it to be “quite important”. Furthermore, 55% of Scots note that there is “quite a lot”, with a further 34% observing that there is “some” child poverty in Scotland. In short, Scots think that child poverty exists and that tackling child poverty is important. The point here is not to reach for the cigar and find comfort that the vast majority of Scots think this way. Rather, the key point is that Scotland should be receptive to solutions to child poverty. If these public attitudes are robust, then there should be public support for measures to tackle poverty. In contrast to the softly, softly approach that was adopted by New Labour when it began to make decisions and take actions to reduce child and pensioner poverty from the late 1990s, there is much to be gained by shouting from the rooftops and making tackling poverty much more central to our purpose. This year’s government figures report the biggest single year rise in poverty in Scotland in recent history. The typical income of Scotland’s poorest households has fallen much more in the last two years than that of the most affluent households. The majority of Scots have never heard of the Child Poverty Strategy for Scotland. A minority of Scots think that business should have a role to play in tackling poverty in Scotland. I am not suggesting that we all become researchers. However, we need to continually refresh and challenge our understanding of poverty in Scotland by making best use of that evidence. And we need – and thankfully, we have got – a body of academics in Scotland who are willing and able to apply their knowledge and skills to support those whose work is primarily concerned to tackle poverty in Scotland. To appropriate an abused phrase, “we are in this together”. McKendrick, JH (2014) Attitudes toward child poverty in contemporary Scotland. Glasgow: The Hunter Foundation. E-mail j.mckendrick@gcu.ac.uk for a free PDF copy of this report. The political discourse and Westminster policy about migration mirrors those around poverty issues in general regarding rights being stratified and state support being denied to increasing parts of the population. For people migrating to the UK there have long been a variety of visa types which have both different rights and different requirements attached to them. However, this has gradually become more explicit with, for example, some visa types having ‘right to reside’ tests applied to them, effectively removing the right to numerous benefits from many migrants regardless of what they pay in tax, and those in the asylum process being denied both sufficient state support and the right to work, which has long-term negative impacts. Part of the rationale for this approach has been simple populism. However, there are other political reasons for this type of stratification. British politics and the accompanying public debate have re-introduced Victorian notions of deserving and undeserving poor. This is joined by restrictions on minority communities having the right to make claims of the British state, leading to a deeply regressive political framework into which migrants must both navigate and live. While the broader welfare climate and its focus on ‘hard working families’, ‘doing the right thing’ is best addressed by others, it does link to the politics of migration. Migration policy is increasingly viewed in relation to wanted and unwanted migrants. Wealthy migrants and those working for large multi-national corporations have few problems in entering the UK, whether through the GATT agreed inter-company transfers (23,000 people in 2011) or Tier 1 entrepreneurs visas (more than 2000 in 2012) they have few problems in terms of either access or, it goes without saying, making ends meet once here, already having a well-paid job and/or considerable resources. This leaves the unwanted side, unwanted in terms of both social class and region of origin facing the brunt of restrictive measures both in terms of getting into Britain (immigration policy) and what they can expect on arrival (immigrant policy). public purse, many migrants are not able to leave for a variety of reasons, some have established family lives here, had children and so forth. Many have also paid significant amounts of money into our tax system, and denying them social services on that basis goes against the contributory principle. Others still have fled despotic regimes and so have no option of return, yet ‘we’ appear to be accepting that poverty, and in some cases destitution, are reasonable results of their need to flee. Refugees have experienced discriminatory immigration regimes with; for example, support levels for those in the asylum system set at just 70% of income support with no other benefits allowed and the denial of the right to work, and yet they are then condemned for both relying on benefits and ‘taking our jobs’. On being recognised as refugees there is also deskilling from time denied the right to work, underemployment and racism alongside a scramble to find appropriate accommodation (almost all newly recognised refugees are made homeless and therefore temporarily housed). A lot is now known about both what causes poverty (and how to fix it) and about many aspects of what constitutes ‘good’ policy-making. However, in relation to preventing poverty and to immigration and immigrant policy ‘we’ are failing to heed the lessons, be it the denial of the right to work for refugees, which leads to long-term difficulties in accessing the labour market; or EU citizens being underemployed so contributing less to society than they could. Many aspects of immigration policy are leading people into poverty, some as a consequence of that policy but also some such as the way refused asylum seekers are treated (many of whom overturn such refusals on appeal) where poverty is a deliberate tool of policy. The imperative of control within the Home Office who control all migration matters leads to other government departments and other levels of government picking up the substantial costs of those policies. At present reserved immigration policy is condemning large numbers of our population to penury. Add to this the much broader assault on the whole notion of the welfare state and poverty is an entirely predictable result, with impacts for the individuals involved, the communities they live in and for society more generally. Elke Heins, Lecturer in Social Policy, University of Edinburgh. 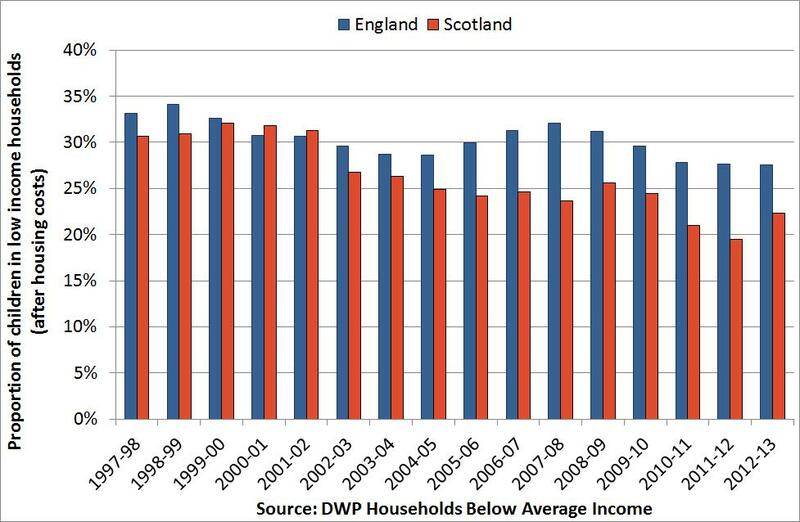 There can be little doubt about the Scottish Government taking the problems of poverty and inequality seriously. As recently as 9 October 2014, Finance Secretary John Swinney emphasised in his budget speech the aim to ‘deliver on the aspirations of the people of Scotland for a more prosperous and fairer Scotland’. The commitment to a ‘flourishing’ Scotland through sustainable economic growth has been at the centre of the public policy agenda in Scotland since 2007 and is reflected in the National Performance Framework, also known as ‘Scotland Performs’. The framework provides a dashboard approach to assess progress towards the delivery of the Scottish Government’s overarching aim of ‘creating a more successful country, with opportunities for all to flourish through increasing sustainable economic growth’. This overall government purpose is supported by seven ‘High Level Targets’ of which two targets for solidarity and cohesion directly relate to concerns with poverty and inequality. It is furthermore underpinned by five ‘Strategic Objectives’ of which the objective for Scotland to become ‘Wealthier and Fairer’ is most closely related to anti-poverty policies. Progress towards these targets and objectives is, in turn, assessed by 16 ‘National Outcomes’ and 50 ‘National Indicators’. For example, the achievement of the solidarity target is measured by an increase in the proportion of income earned by the three lowest income deciles by 2017. A reduction in the proportion of individuals living in poverty (defined as individuals living in households with an equivalised income of less than 60% of the UK median before housing costs) is the most direct indicator to track the progress towards poverty reduction. 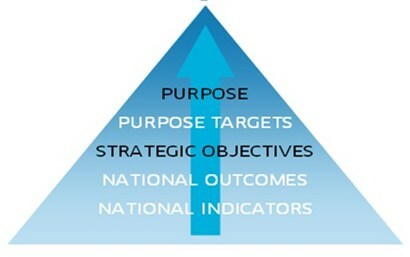 This multi-dimensional and outcomes-oriented Scottish framework signifies a departure from the traditional way of measuring development and social progress through the increase in ‘national wealth’ as measured by the much criticised GDP. This single-minded focus on GDP as the key figure for government performance has for long been substantively criticised as, among other things, it ignores the negative effects of economic growth on people’s lives and does not say anything about the distribution of any created wealth. Scotland is one of a number of countries where this criticism has led to the pioneering of alternative measures. These new approaches are closely related to the fashionable concept of ‘wellbeing’ that gained traction in recent years all over the world among policy makers, academics and practitioners. The concept recognises that national wellbeing has to be understood in a holistic way, not only including economic, but also social and environmental dimensions and the interrelationships between these. Some indicators are too vague; e.g. the national indicator to ‘improve children services’ does not clarify whether this improvement refers to the availability of services, their quality or their affordability and accessibility. As comparative research has shown, all three of these dimensions do matter. A distinction needs to be made between income and wealth as both matter for inequality and poverty, but the focus of the framework is only on the former. There still is an emphasis on traditional economic growth measures throughout the framework. An increase in the number of businesses, for example, does not say anything about the quality of work in these businesses or the environmental impact of their activities. Indicators of decent work (such as the proportion of employers paying a living wage) or of sustainability (such as the proportion of public sector organisations and private enterprises engaging in greener practices) would need to replace indicators that count economic activity without any recognition of its potential harm on the environment, health or poverty. There are no indicators about unemployment, yet we know it is critical to wellbeing and closely related to poverty. It has to be noted that the Scottish Government is aware of some of the shortcomings with its framework and a revision is currently ongoing which is explicitly seeking suggestions for new indicators to improve the framework. Moreover, measuring national performance is only a first step to improve the quality of life in Scotland and the most perfect measuring tool becomes pointless if it is not followed by a readjustment of policy priorities and, in fact, a reform of the very way in which policy is made in order to deliver on the desired outcomes and ambitions. Despite the above criticisms, by and large the Scottish Government is taking steps in the right direction because ‘what is measured is what matters’ (for policy makers). Highlighting the relevance of poverty and inequality through the inclusion in the National Performance Framework and its impact on wellbeing for the whole society is thus more than welcome. Ultimately, the turn towards more encompassing measures of wellbeing rather than a narrow focus on economic growth will hopefully contribute to overcoming the perception that ‘doing good’ is difficult to combine with ‘doing well’. Dr Elke Heins is a Lecturer in Social Policy at the University of Edinburgh. This contribution is based on a Knowledge Exchange Seminar Series called GLADS – Good Lives and Decent Societies, funded by the Scottish Universities Institute in 2014. Poverty and disability are closely linked. Researchers have shown that disabled people are more likely to be out of work, in poorly paid jobs and living in poverty than other groups in society. As a result many disabled people find themselves claiming welfare benefits, including Employment and Support Allowance if they find it difficult to work. My research concerns the history of incapacity benefits, that is, social security benefits for people who are unable to work because of sickness or disability. As I set out to write this post, I wondered what the relevance of this work was for ‘Challenge poverty’ week. After all, ‘challenge poverty’ is about today and anti-poverty campaigners sometimes have an uphill struggle to show that poverty is a problem today, with critics often pointing to the past to show how much worse things used to be. Others in this blog and on the challenge poverty website can explain why poverty is such a problem today. My task is to show how many of the debates about poverty today are rooted in questions which have been around since the beginning of the welfare state and beyond. To show this, let’s have a look at some quotations about people claiming disability benefits. Can you guess the date? 1. “Against the continued advance of a tide of unjustified claims to benefit there are two main lines of defence. The first is the adoption of measures to secure that a proper standard is applied in the issue of medical certificates for incapacity while the second consists in strengthening the safeguards to be adopted by [decision makers] in connection with the supervision of claims”. 2. “A life of idleness is bad for [her], and in our judgment she would have no difficulty in the present state of the domestic labour market, in obtaining suitable remunerative employment which is well within her physical capacity. In her own best interests we strongly recommend the appellant to get work”. 3. “A … person may be regarded as incapable of work because he is unable to travel to work, but it does not follow that because he is unable to travel to his former employment he is entitled to sickness benefit. It is the duty of a .. person to do what is reasonably necessary to regain his position as a wage earner and so overcome the effects of any physical disability which he may be under”. These quotations show that policy makers have been worrying about how to define incapacity for work since the very first sickness benefits in 1911. This concern has led to tough and intrusive mechanisms for checking up on people across the 20th century. The continuing theme which we can see in the development of incapacity benefits is one of distrust: that people cannot be trusted to claim benefits honestly and that there must always be mechanisms for checking up on them and keeping them in line. There has also been a continuing argument that ‘work is good for you’ and that people have a duty to get back to work as soon as possible after illness or disability. Critics of disability benefits policies today argue that access to benefits has become more difficult, first of all by the redefinition of ‘incapacity for work’ brought about by Employment and Support Allowance and, secondly, by the introduction of work requirements for claimants. Both of these changes to benefits policy have made life more difficult for people claiming benefits but the ideas behind them are not new. So what does this have to do with poverty? It is well established that people with health problems and disabilities find it more difficult to get work, to stay in work and to earn adequate wages and that these difficulties are intensified for people with low educational qualifications. So ‘incapacity for work’ has a direct link with poverty. If the benefits paid to people because they are unable to work (or to find work) are kept deliberately low, poverty becomes even further entrenched. It is even worse for those who are refused benefits when the definition of incapacity for work is tightly drawn. Policy makers claim that they make it difficult to claim benefits and that they keep payments low in order to ‘make work pay’ and to encourage people get back to work. That is all very well when decently paid work is available and the barriers to work are removed. But so long as these barriers exist, people will need adequate benefit payments to keep them out of poverty. Bambra, C. (2011) Work, worklessness and the political economy of health. Oxford: Oxford University Press. Roulstone, A. and Prideaux, S. (2012) Understanding Disability Policy. Bristol: Policy Press.